Some leagues, usually 5+ players per team, allow only a portion of their team members to play in each event. 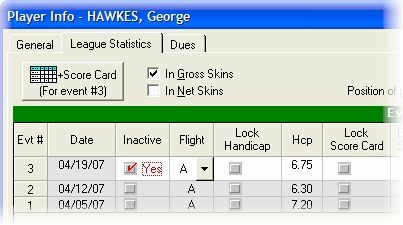 To mark a player as inactive, select the player and type F7 (Function key F7)...or pull up the “Player Information” form's "League Statistics" tab and mark inactive. An “X” will appear next to the name in the view, indicating he/she is inactive. Inactive players will appear at the bottom of each team after sorting player positions. To sort players on team, select “Player Pairing for Team vs Team” on the Tools menu. Click the gray box for the appropriate event number under the "Inactive" column heading. Inactive player is "grayed out" in the View with an "X" to far left.